Here lately it would appears that size does matter when it comes to CPU cooling on air. 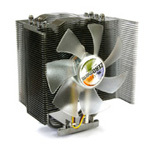 Looking at the picture of the ZEROTherm Nirvana NV120 CPU cooler we can tell that this thing is huge and the Nirvana NV120 shows us a different style right off the bat with its black finish on the cooling fins. Using a 120mm fan coupled with a heatpipe design, we should see some pretty decent numbers produced by the Nirvana NV120 CPU cooler. It sure did show to be a hum dinger of a cooler didn't it! Happy Modding to ya.